In 1927, a prescient astronomer named Georges Lemaître looked at data showing how galaxies move. He noticed something peculiar – all of them appeared to be speeding away from Earth. Not only that, but the farther away they were, the faster they went. He determined a mathematical way to represent this, and connected his relationship to Einstein’s law of General Relativity to produce a grand idea: That of a universe continually expanding. It was a radical idea then, but today it fits with our conception of a universe spawned by a Big Bang. If you’re an astronomy trivia buff, the name associated with the Big Bang is Edwin Hubble, who also has a rather famous telescope named after himself. Hubble also came up with the concept, but Lemaître beat him to the punch, though his idea got little attention at the time. Now, he may finally share in the recognition for his revolutionary theory. It’s too late to rename the Hubble Space Telescope, which is in its twilight years of use anyway. But astronomers are considering renaming the law that explains how the universe expands, from the Hubble Law to the Hubble-Lemaître Law. The matter was brought to a vote in August at a meeting of the International Astronomical Union in Vienna, Austria. This is the same body that decided by a vote in 2006 to demote Pluto from planet to dwarf planet. It’s a decision that still stings for some people, both astronomers and members of the public alike. 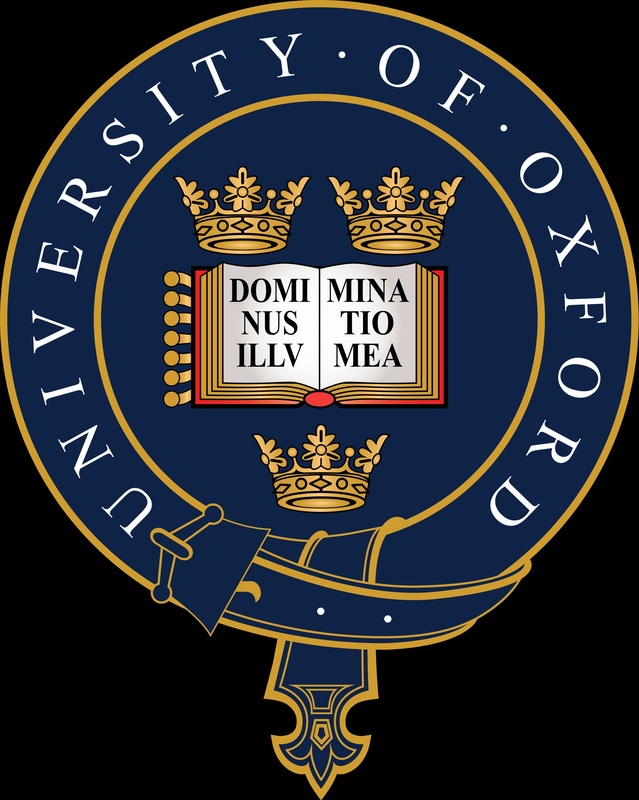 It’s especially contentious because the vote only included the astronomers who were physically present at the 2006 meeting – a tiny fraction of all IAU members. Seeking to avoid the same ruffled feathers, the IAU is taking a different tack this time. Instead of making a final decision at the meeting, attending members took a straw poll to see if there was widespread interest in the change. There was. Now all 13,000-plus members of the IAU will get to have their say in the form of an electronic vote before the end of the year. So who is this priest-scientist they’re considering honoring with a foundational cosmological law? Georges Lemaître was born in Belgium. He volunteered for service in the First World War, interrupting his engineering studies to do so, and earned a medal for his service. Afterwards, he plunged back into academia, this time in physics and math, and began studies to be a priest at the same time. He earned his PhD in 1920, and was ordained in 1923. To some in this increasingly polarized age, it might seem odd for a man to be a soldier and a scientist, a religious and scientific devotee in equal measure. But to Lemaître, it seemed to form a coherent whole. He saw his faith and his research as separate enterprises, which neither conflicted nor aided each other. They were simply parallel explorations of the cosmos, both equally worthy of study and contemplation. Modern audiences will recognize this as an early version of the Big Bang Theory, which sometimes finds itself under attack from those who prefer a divine creation story. But Lemaître faced most of his criticism from fellow scientists, who objected to his theory in large part because it sounded too religious. The idea of a universe that had a beginning flew in the face of the scientific consensus of the time, which preferred a static, unchanging universe. But Lemaître’s idea was based on a purely physical argument. Eventually the scientific community came around, and discovered strong evidence for what came to be called the Big Bang. That evidence even includes “fossil radiation,” which Lemaître posited might appear as cosmic rays, but which astronomers eventually discovered as the cosmic microwave background [CMB] radiation. It’s worth noting that the pope in Lemaître’s time, Pius XII, was delighted that a Catholic priest had conceived of a scientifically valid “creation” story for the universe. It’s also possible, reading between the lines, that the Church was feeling some guilt about the whole Galileo debacle, and looking to clear their conscience. Lemaître himself was less than pleased by the pope butting in, as he viewed his scientific pursuits as completely separate from his religious views, and didn’t appreciate the pope muddying the waters. His Holiness was persuaded to simmer down, but the Catholic Church remains officially in agreement with the Big Bang Theory, and Lemaître retained his good standing in the Church until his death. But so what if Lemaître was an interesting person? The scientific law has been known as Hubble’s Law for decades now. And if we change this, doesn’t that open the door to changing names of all sorts of things? And what does it matter, if the underlying science remains unchanged? All valid points. But if science is about anything, it’s about revealing the truth. And the truth is that Lemaître arrived at the discovery first. Doesn’t he therefore deserve the credit? Then again, Lemaître himself never contested Hubble’s acclaim. He seemed content to let the science speak for itself, whatever it was called. Cold spots are a hot topic in Conformal Cyclic Cosmology. Cosmologists say they have found remnants of a bygone universe in the afterglow of the Big Bang found in the Cosmic Microwave Background (CMB). The discovery gives weight to the controversial theory of Conformal Cyclic Cosmology, or CCC, that suggests our universe is just one of many, built from the remains of a previous one in the Big Bang 13.6 billion years ago. The theory describes an eternal cycle of Big Bang events, repeating into the far distant future, the end of our universe giving rise to a new one. 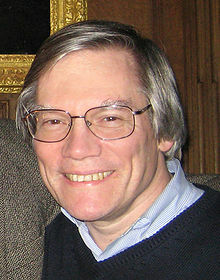 A team led by Oxford University mathematics emeritus Roger Penrose, a former collaborator of the late Stephen Hawking, claims in a new paper lodged on the preprint server arXiv to have found signs of so-called Hawking Points, anomalous high energy features in the CMB. Penrose and colleagues say that these anomalies were made from the last moments of black holes evaporating through “Hawking radiation”. Although black holes are famous for never releasing any light, Hawking proposed a subtle way for light and particles to escape over time. Through quantum mechanical effects, every black hole slowly shrinks and fades, losing its energy through Hawking radiation. “This burst of energy from a now decayed black hole then spreads out quickly in our newly formed universe, leaving a warm central point with a cooling spot around it,” says astronomer Alan Duffy from Australia’s Swinburne University and Lead Scientist of the Royal Institution of Australia, who was not involved in the research. Conformal Cyclic Cosmology strongly conflicts with the current standard model explaining the evolution of the universe. “Unlike previous cyclic universe models, there is no ‘Big Crunch’ where everything comes together again,” explains Duffy. While mathematically the two epochs of expansion are similar, not all cosmologists are convinced that the Big Bang eventually leads to another Big Bang from a future empty universe. The results from Penrose and colleagues are likely to be met with skepticism by many mainstream cosmologists. Penrose first claimed [Concentric circles in WMAP data may provide evidence of violent pre-Big-Bang activity] to have detected Hawking points in 2010. Other researchers shot down the claim in flames, arguing that his discoveries were nothing more than random noise contained in the data. It was 21 March 2013. The world’s scientific press had either gathered in ESA’s Paris headquarters or logged in online, along with a multitude of scientists around the globe, to witness the moment when ESA’s Planck mission revealed its ‘image’ of the cosmos. This image was taken not with visible light but with microwaves. Whereas light that our eyes can see is composed of small wavelengths – less than a thousandth of a millimetre in length – the radiation that Planck was detecting spanned longer wavelengths, from a few tenths of a millimetre to a few millimetres. Most importantly, it had been generated at very beginning of the Universe. Collectively, this radiation is known as the cosmic microwave background, or CMB. By measuring its tiny differences across the sky, Planck’s image had the ability to tell us about the age, expansion, history, and contents of the Universe. It was nothing less than the cosmic blueprint. Astronomers knew what they were hoping to see. Two NASA missions, COBE in the early 1990s and WMAP in the following decade, had already performed an analogous set of sky surveys that resulted in similar images. But those images did not have the precision and sharpness of Planck. The new view would show the imprint of the early Universe in painstaking detail for the first time. And everything was riding on it. If our model of the Universe were correct, then Planck would confirm it to unprecedented levels of accuracy. If our model were wrong, Planck would send scientists back to the drawing board. When the image was revealed, the data had confirmed the model. The fit to our expectations was too good to draw any other conclusion: Planck had showed us an ‘almost perfect Universe’. Why almost perfect? Because a few anomalies remained, and these would be the focus of future research. Now, five years later, the Planck consortium has made their final data release, known as the legacy data release. The message remains the same, and is even stronger. All cosmological models are based upon Albert Einstein’s General Theory of Relativity. To reconcile the general relativistic equations with a wide range of observations, including the cosmic microwave background, the standard model of cosmology includes the action of two unknown components. Firstly, an attractive matter component, known as cold dark matter, which unlike ordinary matter does not interact with light. Secondly, a repulsive form of energy, known as dark energy, which is driving the currently accelerated expansion of the Universe. They have been found to be essential components to explain our cosmos in addition to the ordinary matter we know about. But as yet we do not know what these exotic components actually are. Planck was launched in 2009 and collected data until 2013. Its first release – which gave rise to the almost perfect Universe – was made in the spring of that year. It was based solely on the temperature of the cosmic microwave background radiation, and used only the first two sky surveys from the mission. The data also provided further evidence for a very early phase of accelerated expansion, called inflation, in the first tiny fraction of a second in the Universe’s history, during which the seeds of all cosmic structures were sown. Yielding a quantitative measure of the relative distribution of these primordial fluctuations, Planck provided the best confirmation ever obtained of the inflationary scenario. Besides mapping the temperature of the cosmic microwave background across the sky with unprecedented accuracy, Planck also measured its polarisation, which indicates if light is vibrating in a preferred direction. The polarisation of the cosmic microwave background carries an imprint of the last interaction between the radiation and matter particles in the early Universe, and as such contains additional, all-important information about the history of the cosmos. But it could also contain information about the very first instants of our Universe, and give us clues to understand its birth. In 2015, a second data release folded together all data collected by the mission, which amounted to eight sky surveys. It gave temperature and polarisation but came with a caution. 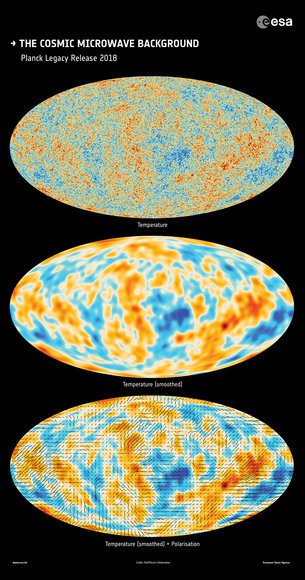 5 February 2015 New maps from ESA’s Planck satellite uncover the ‘polarised’ light from the early Universe across the entire sky, revealing that the first stars formed much later than previously thought. “We felt the quality of some of the polarisation data was not good enough to be used for cosmology,” says Jan. He adds that – of course – it didn’t prevent them from doing cosmology with it but that some conclusions drawn at that time needed further confirmation and should therefore be treated with caution. And that’s the big change for this 2018 Legacy data release. 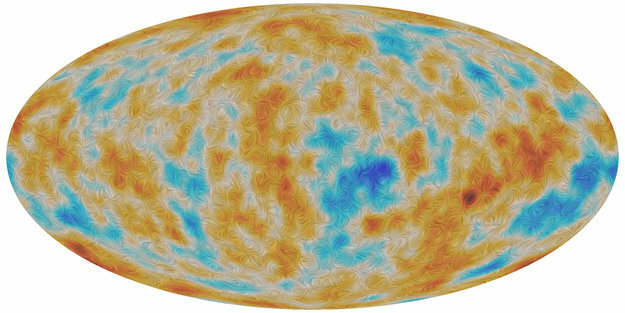 The Planck consortium has completed a new processing of the data. Most of the early signs that called for caution have disappeared. The scientists are now certain that both temperature and polarisation are accurately determined. “Now we really are confident that we can retrieve a cosmological model based on solely on temperature, solely on polarisation, and based on both temperature and polarisation. And they all match,” says Reno Mandolesi, principal investigator of the LFI instrument on Planck at the University of Ferrara, Italy. “Since 2015, more astrophysical data has been gathered by other experiments, and new cosmological analyses have also been performed, combining observations of the CMB at small scales with those of galaxies, clusters of galaxies, and supernovae, which most of the time improved the consistency with Planck data and the cosmological model supported by Planck,” says Jean-Loup Puget, principal investigator of the HFI instrument on Planck at the Institut d’Astrophysique Spatiale in Orsay, France. This is an impressive feat and means that cosmologists can be assured that their description of the Universe as a place containing ordinary matter, cold dark matter and dark energy, populated by structures that had been seeded during an early phase of inflationary expansion, is largely correct. But there are some oddities that need explaining – or tensions as cosmologists call them. One in particular is related to the expansion of the Universe. The rate of this expansion is given by the so-called Hubble Constant. To measure the Hubble constant astronomers have traditionally relied on gauging distances across the cosmos. They can only do this for the relatively local Universe by measuring the apparent brightness of certain types of nearby variable stars and exploding stars, whose actual brightness can be estimated independently. It is a well-honed technique that has been developed over the course of the last century, pioneered by Henrietta Leavitt and later applied, in the late 1920s, by Edwin Hubble and collaborators, who used variable stars in distant galaxies and other observations to reveal that the Universe was expanding. The evolution of measurements of the rate of the Universe’s expansion, given by the so-called Hubble Constant, over the past two decades. The slightly esoteric units give the velocity of the expansion in km/s for every million parsecs (Mpc) of separation in space, where a parsec is equivalent to 3.26 light-years. In recent years, the figure astronomers derive for the Hubble Constant using a wide variety of cutting-edge observations to gauge distances across the cosmos is 73.5 km/s/Mpc, with an uncertainty of only two percent. These measurements are shown in blue. Alternatively, the Hubble Constant can also be estimated from the cosmological model that fits observations of the cosmic microwave background, which represents the very young Universe, and calculate a prediction for what the Hubble Constant should be today. Measurements based on this method using data from NASA’s WMAP satellite are shown in green, and those obtained using data from ESA’s Planck mission are shown in red. When applied to Planck data, this method gives a lower value of 67.4 km/s/Mpc, with a tiny uncertainty of less than a percent. On the one hand, it is extraordinary that two such radically different ways of deriving the Hubble constant – one using the local, mature Universe, and one based on the distant, infant Universe – are so close to each other. On the other hand, in principle these two figures should agree to within their respective uncertainties, causing what cosmologists call a ‘tension’ – an oddity that still needs explaining. The single purple point is a measurement obtained through yet another method, using data from the first simultaneous observation of light and gravitational waves emitted by the same source – a pair of coalescing neutron stars. The figure astronomers derive for the Hubble Constant using a wide variety of cutting-edge observations, including some from Hubble’s namesake observatory, the NASA/ESA Hubble Space Telescope, and most recently from ESA’s Gaia mission, is 73.5 km/s/Mpc, with an uncertainty of only two percent. The slightly esoteric units give the velocity of the expansion in km/s for every million parsecs (Mpc) of separation in space, where a parsec is equivalent to 3.26 light-years. A second way to estimate the Hubble Constant is to use the cosmological model that fits the cosmic microwave background image, which represents the very young Universe, and calculate a prediction for what the Hubble Constant should be today. When applied to Planck data, this method gives a lower value of 67.4 km/s/Mpc, with a tiny uncertainty of less than a percent. On the one hand, it is extraordinary that two such radically different ways of deriving the Hubble constant – one using the local, mature Universe, and one based on the distant, infant Universe – are so close to each other. On the other hand, in principle these two figures should agree to within their respective uncertainties. This is the tension, and the question is how can they be reconciled? Both sides are convinced that any remaining errors in their measurement methodologies are now too small to cause the discrepancy. So could it be that there is something slightly peculiar about our local cosmic environment that makes the nearby measurement somewhat anomalous? We know for example that our Galaxy sits in a slightly under-dense region of the Universe, which could affect the local value of the Hubble constant. Unfortunately, most astronomers think that such deviations are not large enough to resolve this problem. “There is no single, satisfactory astrophysical solution that can explain the discrepancy. 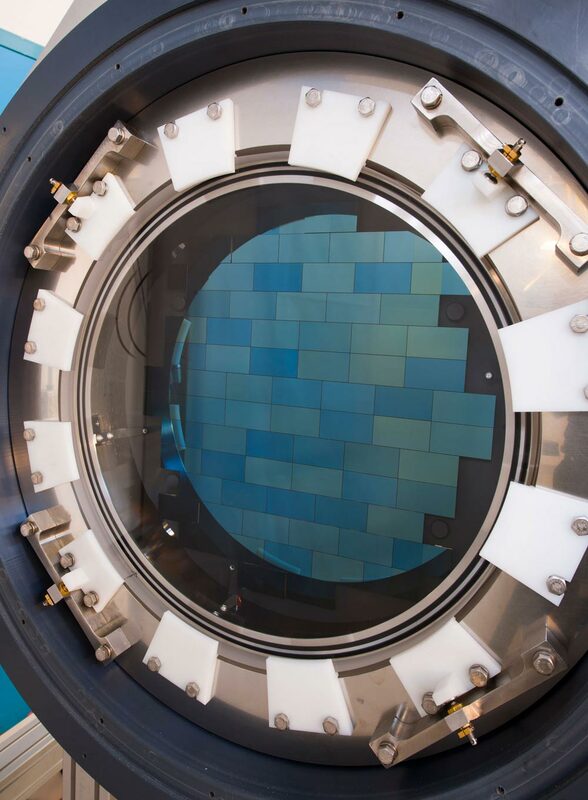 So, perhaps there is some new physics to be found,” says Marco Bersanelli, deputy principal investigator of the LFI instrument at the University of Milan, Italy. ‘New physics’ means that exotic particles or forces could be influencing the results. Yet, as exciting as this prospect feels, the Planck results place severe constraints on this train of thought because it fits so well with the majority of observations. “It is very hard to add new physics alleviating the tension and still keep the standard model’s precise description of everything else that already fits,” says François Bouchet, deputy principal investigator of the HFI instrument at the Institut d’Astrophysique de Paris, France. As a result, no one has been able to come up with a satisfactory explanation for the differences between the two measurements, and the question remains to be resolved. “For the moment, we shouldn’t get too excited about finding new physics: it could well be that the relatively small discrepancy can be explained by a combination of small errors and local effects. But we need to keep improving our measurements and thinking about better ways to explain it,” says Jan. This is the legacy of Planck: with its almost perfect Universe, the mission has given researchers confirmation of their models but with a few details to puzzle over. In other words: the best of both worlds. A series of scientific papers describing the new results was published on 17 July and can be downloaded here. Using the powerful Hubble and Gaia space telescopes, astronomers just took a big step toward finding the answer to the Hubble constant, one of the most important and long-sought numbers in all of cosmology. This number measures the rate at which the universe is expanding since the big bang, 13.8 billion years ago. The constant is named for astronomer Edwin Hubble, who nearly a century ago discovered that the universe was uniformly expanding in all directions. Now, researchers have calculated this number with unprecedented accuracy. Intriguingly, the new results further intensify the discrepancy between measurements for the expansion rate of the nearby universe, and those of the distant, primeval universe — before stars and galaxies even existed. Because the universe is expanding uniformly, these measurements should be the same. The so-called “tension” implies that there could be new physics underlying the foundations of the universe. Using the power and synergy of two space telescopes, astronomers have made the most precise measurement to date of the universe’s expansion rate. The results further fuel the mismatch between measurements for the expansion rate of the nearby universe, and those of the distant, primeval universe — before stars and galaxies even existed. This so-called “tension” implies that there could be new physics underlying the foundations of the universe. Possibilities include the interaction strength of dark matter, dark energy being even more exotic than previously thought, or an unknown new particle in the tapestry of space. Combining observations from NASA’s Hubble Space Telescope and the European Space Agency’s (ESA) Gaia space observatory, astronomers further refined the previous value for the Hubble constant, the rate at which the universe is expanding from the big bang 13.8 billion years ago. But as the measurements have become more precise, the team’s determination of the Hubble constant has become more and more at odds with the measurements from another space observatory, ESA’s Planck mission, which is coming up with a different predicted value for the Hubble constant. 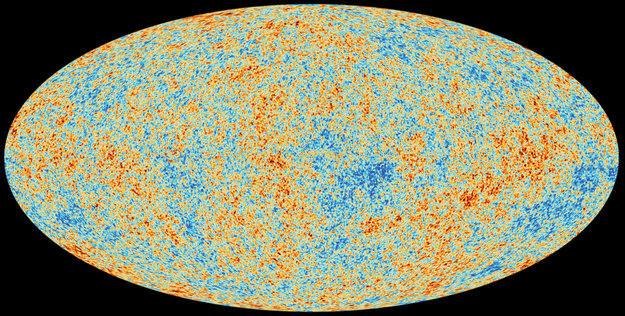 Planck mapped the primeval universe as it appeared only 360,000 years after the big bang. The entire sky is imprinted with the signature of the big bang encoded in microwaves. Planck measured the sizes of the ripples in this Cosmic Microwave Background (CMB) that were produced by slight irregularities in the big bang fireball. The fine details of these ripples encode how much dark matter and normal matter there is, the trajectory of the universe at that time, and other cosmological parameters. These measurements, still being assessed, allow scientists to predict how the early universe would likely have evolved into the expansion rate we can measure today. However, those predictions don’t seem to match the new measurements of our nearby contemporary universe. “With the addition of this new Gaia and Hubble Space Telescope data, we now have a serious tension with the Cosmic Microwave Background data,” said Planck team member and lead analyst George Efstathiou of the Kavli Institute for Cosmology in Cambridge, England, who was not involved with the new work. In 2005, Riess and members of the SHOES (Supernova H0 for the Equation of State) Team set out to measure the universe’s expansion rate with unprecedented accuracy. In the following years, by refining their techniques, this team shaved down the rate measurement’s uncertainty to unprecedented levels. Now, with the power of Hubble and Gaia combined, they have reduced that uncertainty to just 2.2 percent. Because the Hubble constant is needed to estimate the age of the universe, the long-sought answer is one of the most important numbers in cosmology. It is named after astronomer Edwin Hubble, who nearly a century ago discovered that the universe was uniformly expanding in all directions—a finding that gave birth to modern cosmology. Galaxies appear to recede from Earth proportional to their distances, meaning that the farther away they are, the faster they appear to be moving away. This is a consequence of expanding space, and not a value of true space velocity. By measuring the value of the Hubble constant over time, astronomers can construct a picture of our cosmic evolution, infer the make-up of the universe, and uncover clues concerning its ultimate fate. The two major methods of measuring this number give incompatible results. One method is direct, building a cosmic “distance ladder” from measurements of stars in our local universe. The other method uses the CMB to measure the trajectory of the universe shortly after the Big Bang and then uses physics to describe the universe and extrapolate to the present expansion rate. Together, the measurements should provide an end-to-end test of our basic understanding of the so-called “Standard Model” of the universe. However, the pieces don’t fit. Using Hubble and newly released data from Gaia, Riess’ team measured the present rate of expansion to be 73.5 kilometers (45.6 miles) per second per megaparsec. This means that for every 3.3 million light-years farther away a galaxy is from us, it appears to be moving 73.5 kilometers per second faster. However, the Planck results predict the universe should be expanding today at only 67.0 kilometers (41.6 miles) per second per megaparsec. As the teams’ measurements have become more and more precise, the chasm between them has continued to widen, and is now about 4 times the size of their combined uncertainty. Over the years, Riess’ team has refined the Hubble constant value by streamlining and strengthening the “cosmic distance ladder,” used to measure precise distances to nearby and far-off galaxies. They compared those distances with the expansion of space, measured by the stretching of light from nearby galaxies. Using the apparent outward velocity at each distance, they then calculated the Hubble constant. To gauge the distances between nearby galaxies, his team used a special type of star as cosmic yardsticks or milepost markers. These pulsating stars, called Cephied variables, brighten and dim at rates that correspond to their intrinsic brightness. By comparing their intrinsic brightness with their apparent brightness as seen from Earth, scientists can calculate their distances. Gaia further refined this yardstick by geometrically measuring the distance to 50 Cepheid variables in the Milky Way. These measurements were combined with precise measurements of their brightnesses from Hubble. This allowed the astronomers to more accurately calibrate the Cepheids and then use those seen outside the Milky Way as milepost markers. “When you use Cepheids, you need both distance and brightness,” explained Riess. Hubble provided the information on brightness, and Gaia provided the parallax information needed to accurately determine the distances. Parallax is the apparent change in an object’s position due to a shift in the observer’s point of view. Ancient Greeks first used this technique to measure the distance from Earth to the Moon. The goal of Riess’ team is to work with Gaia to cross the threshold of refining the Hubble constant to a value of only one percent by the early 2020s. Meanwhile, astrophysicists will likely continue to grapple with revisiting their ideas about the physics of the early universe. The Riess team’s latest results are published in the July 12 issue of The Astrophysical Journal. A global space astrometry mission, Gaia will make the largest, most precise three-dimensional map of our Galaxy by surveying more than a thousand million stars. Gaia will monitor each of its target stars about 70 times over a five-year period. It will precisely chart their positions, distances, movements, and changes in brightness. It is expected to discover hundreds of thousands of new celestial objects, such as extra-solar planets and brown dwarfs, and observe hundreds of thousands of asteroids within our own Solar System. The mission will also study about 500 000 distant quasars and will provide stringent new tests of Albert Einstein’s General Theory of Relativity. Gaia will create an extraordinarily precise three-dimensional map of more than a thousand million stars throughout our Galaxy and beyond, mapping their motions, luminosity, temperature and composition. This huge stellar census will provide the data needed to tackle an enormous range of important problems related to the origin, structure and evolutionary history of our Galaxy. For example, Gaia will identify which stars are relics from smaller galaxies long ago ‘swallowed’ by the Milky Way. By watching for the large-scale motion of stars in our Galaxy, it will also probe the distribution of dark matter, the invisible substance thought to hold our Galaxy together. Gaia will achieve its goals by repeatedly measuring the positions of all objects down to magnitude 20 (about 400 000 times fainter than can be seen with the naked eye). For all objects brighter than magnitude 15 (4000 times fainter than the naked eye limit), Gaia will measure their positions to an accuracy of 24 microarcseconds. This is comparable to measuring the diameter of a human hair at a distance of 1000 km. It will allow the nearest stars to have their distances measured to the extraordinary accuracy of 0.001%. Even stars near the Galactic centre, some 30 000 light-years away, will have their distances measured to within an accuracy of 20%. In 1887, physicists Alfred Michelson and Edward Morley set up an array of prisms and mirrors in an elegant attempt to measure the passage of the Earth through what was then known as “luminiferous ether” – a mysterious substance through which light waves were believed to propagate, like sound waves through air. The experiment should have worked, but in one of the most famous results of Nineteenth Century physics no ether movement was detected. That was a head-scratcher until 1905, when Albert Einstein took the results at face value and used them as a cornerstone in developing his theory of relativity. Today, physicists are hunting for two equally mysterious commodities: dark matter and dark energy. And maybe, suggests a recent line of research from astrophysicist André Maeder at the University of Geneva, Switzerland, they too don’t exist, and scientists need to again revise their theories, this time to look for ways to explain the universe without the need for either of them. Dark matter was first proposed all the way back in 1933, when astrophysicists realised there wasn’t enough visible matter to explain the motions of stars and galaxies. Instead, there appeared to be a hidden component contributing to the gravitational forces affecting their motion. It is now believed that even though we still have not successfully observed it, dark matter is five times more prevalent in the universe than normal matter. Dark energy came into the picture more recently, when astrophysicists realised that the expansion of the universe could not be explained without the existence of some kind of energy that provides a repulsive force that steadily accelerates the rate at which galaxies are flying away from each other. Dark energy is believed to be even more prevalent than dark matter, comprising a full 70% of the universe’s total mass-energy. Maeder’s argument, published in a series of papers this year in The Astrophysical Journal is that maybe we don’t need dark matter and dark energy to explain these effects. Maybe it’s our concept of Einsteinian space-time that’s wrong. If so, that would affect our entire understanding of gravity and the evolution of the universe. Based on this hypothesis, Maeder found that with the right parameters he could explain the expansion of the universe without dark energy. He could also explain the motion of stars and galaxies without the need for dark matter. Specifically, Mack notes that the strongest evidence for dark matter comes not from the motions of stars and galaxies, “but from the behavior of matter on cosmological scales, as measured by signatures in the cosmic microwave background [CMB] and the distribution of galaxies.” Gravitational lensing of distant objects by nearer galaxies also reveals the existence of dark matter, she says. The challenge, she says, is to reproduce everything, including “dark matter and dark energy’s biggest successes.” Until a new theory can produce “precise agreement” with measurements of a wide range of cosmic variables, she says, there’s no reason “at all” to throw out the existing theory. That said, this doesn’t mean that “new physics” theories such as Maeder’s should be ignored. “They should be, and are, taken seriously,” he says. Q: What is the Big Bang? A: The Big Bang is a really misleading name for the expanding universe that we see. We see an infinite universe with distant galaxies all rushing away from each other. The name Big Bang conveys the idea of a firecracker exploding at a time and a place — with a center. The universe doesn’t have a center, at least not one we can find. The Big Bang happened everywhere at once and was a process happening in time, not a point in time. We know this because 1) we see galaxies rushing away from each other, not from a central point; 2) we see the heat that was left over from early times, and that heat uniformly fills the universe; and 3) we can calculate and imagine what the universe was like when the parts were much closer together, and the calculations match everything we can see. Q: Can we see the Big Bang? A: No, the Big Bang itself is not something we can see. Q: What can we see? A: We can see the heat radiation that was there when the universe was young. We see this heat as it was about 380,000 years after the expansion of the universe began 13.8 billion years ago (which is what we refer to as the Big Bang). This heat covers the entire sky and fills the universe. (In fact it still does.) We were able to map it with satellites we (NASA and ESA) built called the Cosmic Background Explorer (COBE), the Wilkinson Microwave Anisotropy Probe (WMAP), and Planck. The universe at this point was extremely smooth, with only tiny ripples in temperature. All-sky image of the infant universe, created from nine years of data from the Wilkinson Microwave Anisotropy Probe (WMAP). Q: I heard the James Webb Space Telescope will see back further than ever before. What will Webb see? A: COBE, WMAP, and Planck all saw further back than Webb, though it’s true that Webb will see farther back than Hubble. Webb was designed not to see the beginnings of the universe, but to see a period of the universe’s history that we have not seen yet. Specifically, we want to see the first objects that formed as the universe cooled down after the Big Bang. That time period is perhaps hundreds of millions of years later than the one COBE, WMAP, and Planck were built to see. We think that the tiny ripples of temperature they observed were the seeds that eventually grew into galaxies. We don’t know exactly when the universe made the first stars and galaxies — or how for that matter. That is what we are building Webb to help answer. Q: Why can’t Hubble see the first stars and galaxies forming? A: The only way we can see back to the time when these objects were forming is to look very far away. Hubble isn’t big enough or cold enough to see the faint heat signals of these objects that are so far away. Q: Why do we want to see the first stars and galaxies forming? A: The chemical elements of life were first produced in the first generation of stars after the Big Bang. We are here today because of them — and we want to better understand how that came to be! We have ideas, we have predictions, but we don’t know. One way or another the first stars must have influenced our own history, beginning with stirring up everything and producing the other chemical elements besides hydrogen and helium. So if we really want to know where our atoms came from, and how the little planet Earth came to be capable of supporting life, we need to measure what happened at the beginning. Dr. John Mather is the senior project scientist for the James Webb Space Telescope. Dr. Mather shares the 2006 Nobel Prize for Physics with George F. Smoot of the University of California for their work using the COBE satellite to measure the heat radiation from the Big Bang. The James Webb Space Telescope, the scientific complement to NASA’s Hubble Space Telescope, will be the premier space observatory of the next decade. Webb is an international project led by NASA with its partners, ESA (European Space Agency) and CSA (Canadian Space Agency). The missing links between galaxies have finally been found. This is the first detection of the roughly half of the normal matter in our universe – protons, neutrons and electrons – unaccounted for by previous observations of stars, galaxies and other bright objects in space. Two separate teams found the missing matter – made of particles called baryons rather than dark matter – linking galaxies together through filaments of hot, diffuse gas. “The missing baryon problem is solved,” says Hideki Tanimura at the Institute of Space Astrophysics in Orsay, France, leader of one of the groups. 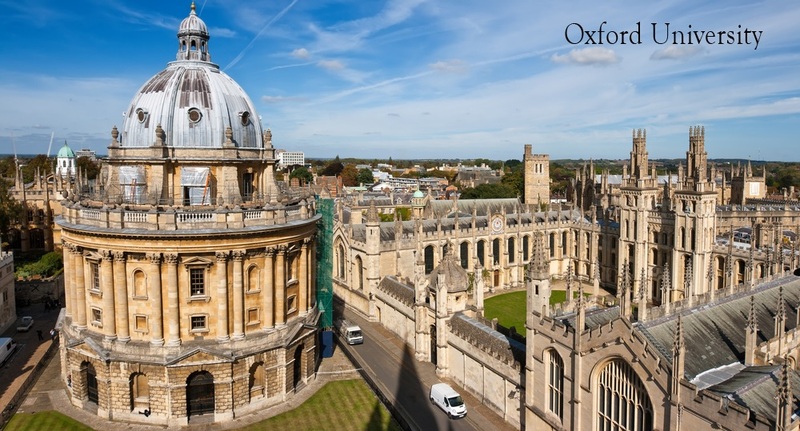 The other team was led by Anna de Graaff at the University of Edinburgh, UK. Because the gas is so tenuous and not quite hot enough for X-ray telescopes to pick up, nobody had been able to see it before. So the two groups had to find another way to definitively show that these threads of gas are really there. Both teams took advantage of a phenomenon called the Sunyaev-Zel’dovich effect that occurs when light left over from the big bang passes through hot gas. As the light travels, some of it scatters off the electrons in the gas, leaving a dim patch in the cosmic microwave background [CMB] – our snapshot of the remnants from the birth of the cosmos. In 2015, the Planck satellite created a map of this effect throughout the observable universe. Because the tendrils of gas between galaxies are so diffuse, the dim blotches they cause are far too slight to be seen directly on Planck’s map. Both teams selected pairs of galaxies from the Sloan Digital Sky Survey that were expected to be connected by a strand of baryons. They stacked the Planck signals for the areas between the galaxies, making the individually faint strands detectable en masse. Tanimura’s team stacked data on 260,000 pairs of galaxies, and de Graaff’s group used over a million pairs. Both teams found definitive evidence of gas filaments between the galaxies. Tanimura’s group found they were almost three times denser than the mean for normal matter in the universe, and de Graaf’s group found they were six times denser – confirmation that the gas in these areas is dense enough to form filaments. Finally finding the extra baryons that have been predicted by decades of simulations validates some of our assumptions about the universe. “Everybody sort of knows that it has to be there, but this is the first time that somebody – two different groups, no less – has come up with a definitive detection,” says Ralph Kraft at the Harvard-Smithsonian Center for Astrophysics in Massachusetts. “This goes a long way toward showing that many of our ideas of how galaxies form and how structures form over the history of the universe are pretty much correct,” he says. 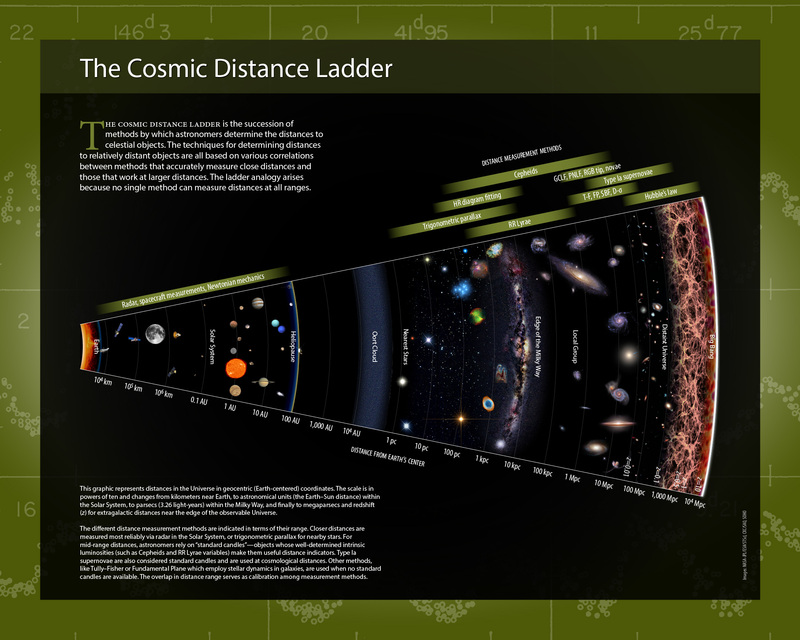 Timescape cosmology offers a way around one of the universe’s best mysteries. One of my personal favorite features of the universe is that it is at this moment being ripped to shreds. Granted, it’s so far a very slow ripping, but, thanks to a peculiar property often referred to as dark energy, the universe is not just expanding, but it is accelerating in its expansion. It will continue to do so, which means that as time increases, it will expand faster and faster. Eventually all of this ripping will render existence an endless expanse of cold nothingness. Space will have been shredded and scattered to infinity. This is a still pretty new understanding. Though Einstein kinda-sorta predicted it, it wasn’t until the 1990s that observations of distant supernovae indicated to astronomers that space is receding from itself, that there is some fundamental-seeming driver―commonly referred to as dark energy―that makes empty spaces want to become bigger and emptier. The evidence was that light from these supernovae appeared to be redshifted, a phenomenon where life waves become stretched out as a light source moves away from the observer. According to a paper published this week in the Monthly Notices of the Royal Astronomical Society, we might just be wrong about all of this. The accelerating expansion may just be a sort of illusion driven by an incorrect assumption about the nature of the distribution of mass across the universe. As cosmological assumptions go, it’s a big one: The universe will remain, on average, smooth and uniform in all locations and from all perspectives. In more technical terms, we’re talking about the cosmological properties of isotropy and homogeneity. Together, they form the cosmological principle, which is mostly supported by the apparent uniformity of the cosmic microwave background. What the authors behind the current study suggest is that maybe the cosmological principle is bunk, and, if this is the case, then observations of distant supernovae take on a different meaning because we can no longer assume that the universe looks about the same for every observer in every location. “While the remarkable isotropy of the CMB points to an initial state with a very high degree of smoothness, the late epoch Universe encompasses a complex cosmic web of structures,” the paper notes. “It is dominated in volume by voids that are threaded and surrounded by clusters of galaxies distributed in sheets, knots and filaments.” In other words, space doesn’t really look all that smooth and uniform after all. The researchers’ alternative has a name: the timescape scenario. Because matter distributions may differ across the universe, different observers and different points within that space can be imagined to have their own relatively independent clocks (per Einstein, gravity bends light and so it bends time). With different notions of time, these different locations will then have different notions of cosmic expansion. The study doesn’t read like a classic crank/contrarian screed and the authors seem willing enough to concede that there may well be nothing to it. It will just depend on more data. In the meantime, the timescape scenario may at least serve as a “diagnostic tool” or alternative perspective that can help astronomers better test current understandings of the large-scale structure of the universe. The future is wonderful, the future is terrifying. We should know, we live there. Whether on the ground or on the web, Motherboard travels the world to uncover the tech and science stories that define what’s coming next for this quickly-evolving planet of ours. Motherboard is a multi-platform, multimedia publication, relying on longform reporting, in-depth blogging, and video and film production to ensure every story is presented in its most gripping and relatable format. Beyond that, we are dedicated to bringing our audience honest portraits of the futures we face, so you can be better informed in your decision-making today. In a much-anticipated analysis of its first year of data, the Dark Energy Survey (DES) telescope experiment has gauged the amount of dark energy and dark matter in the universe by measuring the clumpiness of galaxies — a rich and, so far, barely tapped source of information that many see as the future of cosmology. The analysis, posted on DES’s website today and based on observations of 26 million galaxies in a large swath of the southern sky, tweaks estimates only a little. It draws the pie chart of the universe as 74 percent dark energy and 21 percent dark matter, with galaxies and all other visible matter — everything currently known to physicists — filling the remaining 5 percent sliver. The results are based on data from the telescope’s first observing season, which began in August 2013 and lasted six months. Since then, three more rounds of data collection have passed; the experiment begins its fifth and final planned observing season this month. 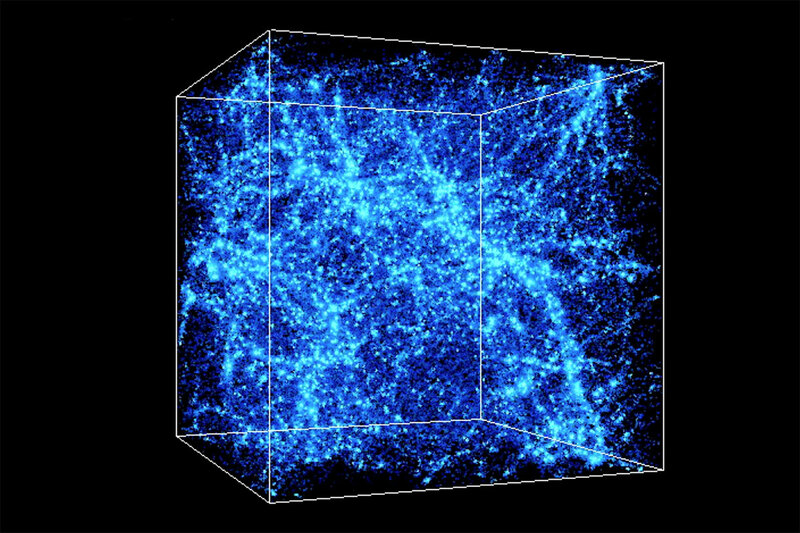 As the 400-person team analyzes more of this data in the coming years, they’ll begin to test theories about the nature of the two invisible substances that dominate the cosmos — particularly dark energy, “which is what we’re ultimately going after,” said Joshua Frieman, co-founder and director of DES and an astrophysicist at Fermi National Accelerator Laboratory (Fermilab) and the University of Chicago. Already, with their first-year data, the experimenters have incrementally improved the measurement of a key quantity that will reveal what dark energy is. Both terms — dark energy and dark matter — are mental place holders for unknown physics. “Dark energy” refers to whatever is causing the expansion of the universe to accelerate, as astronomers first discovered it to be doing in 1998. And great clouds of missing “dark matter” have been inferred from 80 years of observations of their apparent gravitational effect on visible matter (though whether dark matter consists of actual particles or something else, nobody knows). The Dark Energy Survey uses a 570-megapixel camera mounted on the Victor M. Blanco Telescope in Chile (left). The camera is made out of 74 individual light-gathering wafers. Until now, the best way to inventory the cosmos has been to look at the Cosmic Microwave Background [CMB]: pristine light from the infant universe that has long served as a wellspring of information for cosmologists, but which — after the Planck space telescope mapped it in breathtakingly high resolution in 2013 — has less and less to offer. Cosmic microwaves come from the farthest point that can be seen in every direction, providing a 2-D snapshot of the universe at a single moment in time, 380,000 years after the Big Bang (the cosmos was dark before that). Planck’s map of this light shows an extremely homogeneous young universe, with subtle density variations that grew into the galaxies and voids that fill the universe today. Galaxies, after undergoing billions of years of evolution, are more complex and harder to glean information from than the cosmic microwave background, but according to experts, they will ultimately offer a richer picture of the universe’s governing laws since they span the full three-dimensional volume of space. “There’s just a lot more information in a 3-D volume than on a 2-D surface,” said Scott Dodelson, co-chair of the DES science committee and an astrophysicist at Fermilab and the University of Chicago. To obtain that information, the DES team scrutinized a section of the universe spanning an area 1,300 square degrees wide in the sky — the total area of 6,500 full moons — and stretching back 8 billion years (the data were collected by the half-billion-pixel Dark Energy Camera mounted on the Victor M. Blanco Telescope in Chile). They statistically analyzed the separations between galaxies in this cosmic volume. They also examined the distortion in the galaxies’ apparent shapes — an effect known as “weak gravitational lensing” that indicates how much space-warping dark matter lies between the galaxies and Earth. These two probes — galaxy clustering and weak lensing — are two of the four approaches that DES will eventually use to inventory the cosmos. Already, the survey’s measurements are more precise than those of any previous galaxy survey, and for the first time, they rival Planck’s. The DES scientists spent six months processing their data without looking at the results along the way — a safeguard against bias — then “unblinded” the results during a July 7 video conference. 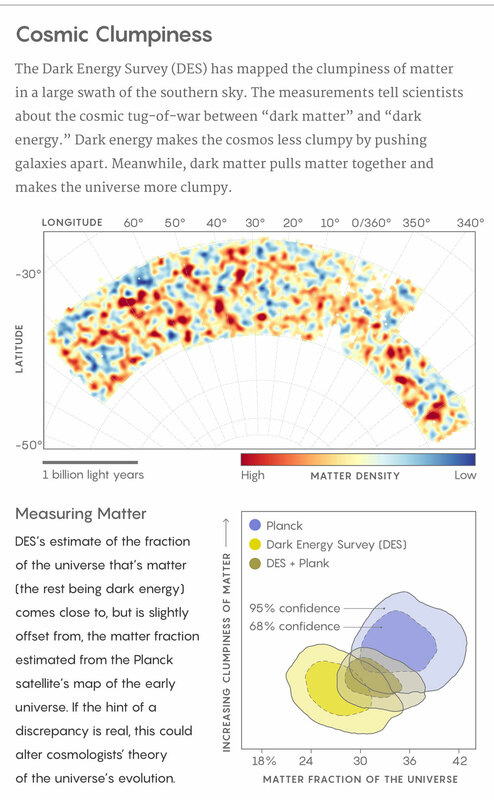 After team leaders went through a final checklist, a member of the team ran a computer script to generate the long-awaited plot: DES’s measurement of the fraction of the universe that’s matter (dark and visible combined), displayed together with the older estimate from Planck. “We were all watching his computer screen at the same time; we all saw the answer at the same time. That’s about as dramatic as it gets,” said Gary Bernstein, an astrophysicist at the University of Pennsylvania and co-chair of the DES science committee. Planck pegged matter at 33 percent of the cosmos today, plus or minus two or three percentage points. When DES’s plots appeared, applause broke out as the bull’s-eye of the new matter measurement centered on 26 percent, with error bars that were similar to, but barely overlapped with, Planck’s range. Statistically speaking, there’s only a slight tension between the two results: Considering their uncertainties, the 26 and 33 percent appraisals are between 1 and 1.5 standard deviations or “sigma” apart, whereas in modern physics you need a five-sigma discrepancy to claim a discovery. The mismatch stands out to the eye, but for now, Frieman and his team consider their galaxy results to be consistent with expectations based on the cosmic microwave background. Whether the hint of a discrepancy strengthens or vanishes as more data accumulate will be worth watching as the DES team embarks on its next analysis, expected to cover its first three years of data. If the possible discrepancy between the cosmic-microwave and galaxy measurements turns out to be real, it could create enough of a tension to lead to the downfall of the “Lambda-CDM model” of cosmology, the standard theory of the universe’s evolution. Lambda-CDM is in many ways a simple model that starts with Albert Einstein’s general theory of relativity, then bolts on dark energy and dark matter. A replacement for Lambda-CDM might help researchers uncover the quantum theory of gravity that presumably underlies everything else. According to Lambda-CDM, dark energy is the “cosmological constant,” represented by the Greek symbol lambda Λ in Einstein’s theory; it’s the energy that infuses space itself, when you get rid of everything else. This energy has negative pressure, which pushes space away and causes it to expand. New dark energy arises in the newly formed spatial fabric, so that the density of dark energy always remains constant, even as the total amount of it relative to dark matter increases over time, causing the expansion of the universe to speed up. On the other hand, dark energy could be something else entirely. Frieman, whom colleagues jokingly refer to as a “fallen theorist,” studied alternative models of dark energy before co-founding DES in 2003 in hopes of testing his and other researchers’ ideas. The leading alternative theory envisions dark energy as a field that pervades space, similar to the “inflaton field” that most cosmologists think drove the explosive inflation of the universe during the Big Bang. The slowly diluting energy of the inflaton field would have exerted a negative pressure that expanded space, and Frieman and others have argued that dark energy might be a similar field that is dynamically evolving today. DES’s new analysis incrementally improves the measurement of a parameter that distinguishes between these two theories — the cosmological constant on the one hand, and a slowly changing energy field on the other. If dark energy is the cosmological constant, then the ratio of its negative pressure and density has to be fixed at −1. Cosmologists call this ratio w. If dark energy is an evolving field, then its density would change over time relative to its pressure, and w would be different from −1. Remarkably, DES’s first-year data, when combined with previous measurements, pegs w’s value at −1, plus or minus roughly 0.04. However, the present level of accuracy still isn’t enough to tell if we’re dealing with a cosmological constant rather than a dynamic field, which could have w within a hair of −1. “That means we need to keep going,” Frieman said. The DES scientists will tighten the error bars around w in their next analysis, slated for release next year; they’ll also measure the change in w over time, by probing its value at different cosmic distances. (Light takes time to reach us, so distant galaxies reveal the universe’s past). If dark energy is the cosmological constant, the change in w will be zero. A nonzero measurement would suggest otherwise. Larger galaxy surveys might be needed to definitively measure w and the other cosmological parameters. 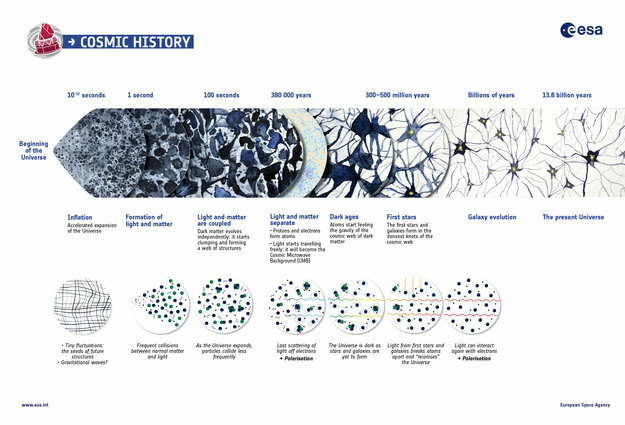 In the early 2020s, the ambitious Large Synoptic Survey Telescope (LSST) will start collecting light from 20 billion galaxies and other cosmological objects, creating a high-resolution map of the universe’s clumpiness that will yield a big jump in accuracy. The data might confirm that we occupy a Lambda-CDM universe, infused with an inexplicably tiny cosmological constant and full of dark matter whose nature remains elusive. But Frieman doesn’t discount the possibility of discovering that dark energy is an evolving quantum field, which would invite a deeper understanding by going beyond Einstein’s theory and tying cosmology to quantum physics. Formerly known as Simons Science News, Quanta Magazine is an editorially independent online publication launched by the Simons Foundation to enhance public understanding of science. Why Quanta? Albert Einstein called photons “quanta of light.” Our goal is to “illuminate science.” At Quanta Magazine, scientific accuracy is every bit as important as telling a good story. All of our articles are meticulously researched, reported, edited, copy-edited and fact-checked. “Space is big. You just won’t believe how vastly, hugely, mind- bogglingly big it is. I mean, you may think it’s a long way down the road to the chemist’s, but that’s just peanuts to space.” – Douglas Adams, Hitchhikers Guide to the Galaxy. In one sense the edge of the universe is easy to mark out: it’s the distance a beam of light could have travelled since the beginning of time. Anything beyond is impossible for us to observe, and so outside our so-called ‘observable universe’. You might guess that the distance from the centre of the universe to the edge is simply the age of the universe (13.8 billion years) multiplied by the speed of light: 13.8 billion light years. But space has been stretching all this time; and just as an airport walkway extends the stride of a walking passenger, the moving walkway of space extends the stride of light beams. It turns out that in the 13.8 billion years since the beginning of time, a light beam could have travelled 46.3 billion light years from its point of origin in the Big Bang. If you imagine this beam tracing a radius, the observable universe is a sphere whose diameter is double that: 92.6 billion light years. But we have good reasons to suspect the entire Universe (capitalised now to distinguish from the merely observable universe) goes on a lot further than the part we can observe – and that it is possibly infinite. So how can we know what goes on beyond the observable universe? Imagine a bacterium swimming in a fishbowl. How could it know the true extent of its seemingly infinite world? Well, distortions of light from the curvature of the glass might give it a clue. In the same way, the curvature of the universe tells us about its ultimate size. “The geometry of the universe can be of three different kinds,” says Robert Trotta, an astrophysicist at Imperial College London. It could be closed (like a sphere), open (like a saddle) or flat (like a table). Universal geometry: the universe could be closed like sphere, open like a saddle or flat like a table. The first option would make it finite; the other two, infinite. The key to measuring its curvature is the cosmic microwave background (CMB) radiation – a wash of light given out by the fireball of plasma that pervaded the universe 400,000 years after the Big Bang. It’s our snapshot of the universe when it was very young and about 1,000 times smaller than it is today. Just as ancient geographers once used the curviness of the Earth’s horizon to work out the size of our planet, astronomers are using the curvinesss of the CMB at our cosmic horizon to estimate the size of the universe. The key is to use satellites to measure the temperature of different features in the CMB. The way these features distort across the CMB landscape is used to calculate its geometry. “So determining the size and geometry, of the Universe helps us determine what happened right after its birth,” Trotta says. Since the late 1980s, three generations of satellites have mapped the CMB with ever improving resolution, generating better and better estimates of the universe’s curvature. The latest data, released in March 2013, came from the European Space Agency’s Planck telescope. It estimated the curvature to be completely flat, at least to within a measurement certainty of plus or minus 0.4%. The extreme flatness of the universe supports the theory of cosmic inflation. This theory holds that in a fraction of a second (10−36 second to be precise) just after its birth, the universe inflated like a balloon, expanding many orders of magnitude while stretching and flattening its surface features. Perfect flatness would mean the universe is infinite, though the plus or minus 0.4% margin of error means we can’t be sure. It might still be finite but very big. Using the Planck data, Trotta and his colleagues worked out the minimum size of the actual Universe would have to be at least 250 times greater than the observable universe. The next generation of telescopes should improve on the data from the Planck telescope. Whether they will give us a definitive answer about the size of the universe remains to be seen. “I imagine that we will still treat the universe as very nearly flat and still not know well enough to rule out open or closed for a long time to come,” says Charles Bennet, head of the new CLASS array of microwave telescopes in Chile. As it turns out, owing to background noise there are fundamental limits to how well we can ever measure the curvature, no matter how good the telescopes get. In July 2016, physicists at Oxford worked out we cannot possibly measure a curvature below about 0.01%. So we still have a ways to go, though measurements so far, and the evidence from inflation theory, has most physicists weighing toward the view the universe is probably infinite. An impassioned minority, however, have had a serious problem with that. So how come physicists keep allowing that the universe itself may be infinite? The idea goes back to the founding fathers of physics. Newton, for example, reasoned that the universe must be infinite based on his law of gravitation. It held that everything in the universe attracted everything else. But if that were so, eventually the universe would be pulled towards a single point, in the way that a star eventually collapses under its own weight. This was at odds with his firm belief the universe had always existed. So, he figured, the only explanation was infinity – the equal pull in all directions would keep the universe static, and eternal. Albert Einstein, 250 years later at the start of the 20th century, similarly envisioned an eternal and infinite universe. General relativity, his theory of the universe on the grandest scales, plays out on an infinite landscape of spacetime. Mathematically speaking, it is easier to propose a universe that goes on forever than to have to deal with the edges. Yet to be infinite is to be unreal – a hyperbole, an absurdity. In his short story The Library of Babel, Argentinian writer Jorge Luis Borges imagines an infinite library containing every possible book of exactly 410 pages: “…for every sensible line of straightforward statement, there are leagues of senseless cacophonies, verbal jumbles and incoherences.” Because there are only so many possible arrangements of letters, the possible number of books is limited, and so the library is destined to repeat itself. An infinite Universe leads to similar conclusions. Because there are only so many ways that atoms can be arranged in space (even within a region 93 billion light years across), an infinite Universe requires that there must be, out there, another huge region of space identical to ours in every respect. That means another Milky Way, another Earth, another version of you and another of me. Levin was one of the first theorists to approach general relativity from a new perspective. Rather than thinking about geometry, which describes the shape of space, she looked at its topology: the way it was connected. All those assumptions about flat, closed or open universes were only valid for huge, spherical universes, she argued. Other shapes could be topologically ‘flat’ and still finite. “Your idea of a donut-shaped universe is intriguing, Homer,” says Stephen Hawking in a 1999 episode of The Simpsons. “I may have to steal it.” Actually, the show’s writers had already stolen the idea from Levin—who published her analysis of a donut-shaped universe in 1998. A donut, she noted, actually had – “topologically speaking” – zero curvature because the negative curvature on the inside is balanced by the positive curvature on the outside. The (near) zero curvature measured in the CMB was therefore as consistent with a donut as with a flat surface. One ring theory to rule them all: CMB data doesn’t rule out a donut-shape, but it would be an awfully big one. Mehau Kulyk / Getty Images. In such a universe, Levin realised, you might cross the cosmos in a spaceship, the way sailors crossed the globe, and find yourself back where you started. This idea inspired Australian physicist Neil Cornish, now based at Montana State University, to think about how the very oldest light, from the CMB, might have circumnavigated the cosmos. If the donut universe were below a threshold size, that would create a telltale signature, which Cornish called “circles in the sky”. 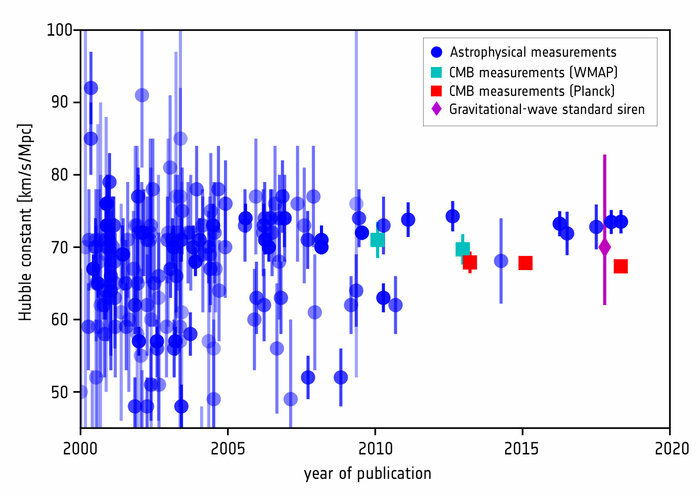 Alas, when CMB data came back from the Wilkinson Microwave Anisotropy Probe (WMAP) in 2001, no such signatures were found. That doesn’t rule out the donut theory entirely; but it does mean that the universe, if it is a donut, is an awfully big one. Attempts to directly prove or disprove the infinity of the universe seem to lead us to a dead-end, at least with current technology. But we might do it by inference, Cornish believes. Inflation theory does a compelling job of explaining the key features of our universe; and one of the offshoots of inflation is the multiverse theory. It’s the kind of theory that, when you first hear it, seems to have sprung from the mind of a science-fiction author indulging in mind-expanding substances. Actually it was first proposed by influential Stanford physicist Andrei Linde in the 1980s. Linde – together with Alan Guth at MIT and Alexei Starobinsky at Russia’s Landau Institute for Theoretical Physics – was one of the architects of inflation theory. Guth and Starobinsky’s original ideas had inflation petering out in the first split second after the big bang; Linde, however, had it going on and on, with new universes sprouting off like an everlasting ginger root. Linde has since showed that “eternal inflation” is probably an inevitable part of any inflation model. This eternal inflation, or multiverse, model is attractive to Linde because it solves the greatest mystery of all: why the laws of physics seem fine-tuned to allow our existence. The strength of gravity is just enough to allow stable stars to form and burn, the electromagnetic and nuclear forces are just the right strength to allow atoms to form, for complex molecules to evolve, and for us to come to be. In each newly sprouted universe these constants get assigned randomly. In some, gravity might be so strong that the universe recollapses immediately after its big bang. In others, gravity would be so weak that atoms of hydrogen would never condense into stars or galaxies. With an infinite number of new universes sprouting into and out of existence, by chance one will pop up that is fit for life to evolve. Infinite variety: in the the eternal inflation model, new universes sprout off like an everlasting ginger root. Andrei Linde. The multiverse theory has its critics, notably another co-founder of inflation theory, Paul Steinhardt. who told Scientific American in 2014: “Scientific ideas should be simple, explanatory, predictive. The inflationary multiverse as currently understood appears to have none of those properties.” Meanwhile Paul Davies at the University of Arizona wrote in The New York Times that “invoking an infinity of unseen universes to explain the unusual features of the one we do see is just as ad hoc as invoking an unseen creator”. To settle the issue, we will need to know more about what went down in the first split-second of the universe. Perhaps gravitational waves will be the answer, a way to ‘hear’ the vibrations of the big bang itself.